Food proteins and bioactive peptides play a vital role in the growth and development of the body’s structural integrity and regulation, as well as having a variety of other functional properties. Land animal-derived food proteins such as collagen and gelatine carry risks of contamination (such as BSE). Marine-derived proteins, which can provide equivalents to collagen and gelatin without the associated risks, are becoming more popular among consumers because of their numerous health beneficial effects. Most marine-derived bioactive peptides are currently underutilized. While fish and shellfish are perhaps the most obvious sources of such proteins and peptides, there is also the potential for further development of proteins and peptides from sources like algae, sea cucumber and molluscs. Marine-derived proteins and peptides also have potential uses in novel products, with the possibility of wide commercialization in the food, beverage, pharmaceutical and cosmetic industries, as well as in other fields such as photography, textiles, leather, electronics, medicine and biotechnology. Marine Proteins and Peptides: Biological Activities and Applications presents an overview of the current status, future industrial perspectives and commercial trends of bioactive marine-derived proteins and peptides. Many of the industrial perspectives are drawn from the food industry, but the book also refers to the pharmaceutical and cosmetics industries. There have recently been significant advances in isolating functional ingredients from marine bio-resources and seafood by-products for use in these industries, but little has been published, creating a knowledge gap, particularly with regard to the isolation and purification processes. This book is the first to fill that gap. 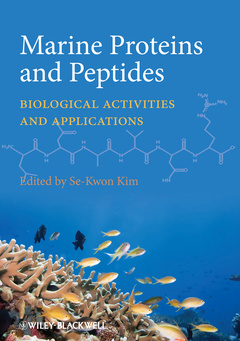 Marine Proteins and Peptides: Biological Activities and Applications is a valuable resource for researchers in marine biochemistry field as well as food industry managers interested in exploring novel techniques and knowledge on alternative food protein sources. It will become a standard reference book for researchers involved in developing marine bio-resources and seafood by-products for novel nutraceutical, cosmetics, and pharmaceutical applications. It will also appeal to managers and product developers in the food, pharmaceutical and cosmetics industries, particularly those looking to use marine-derived proteins and peptides as substitutes or replacements for unfashionable or outdated food components.